13th March 1999 - Southern Highlands, New South Wales. COPYRIGHT: All photos on this and my other pages are copyright . However use for any non-profit purposes can be had in most instances by simply E Mailing first. Please note that photos have been compressed to aid quicker web viewing. Original prints are of better quality. Clocked up some serious kilometres today, thanks to poor decisions, then reversal of chase route. The 13th March 1999 was one of those days that looked great on the models. LI's where moderate at -6 and upper level winds would be strong enough to ensure activity. The upper atmosphere was also a bit colder than normal for March. At 12.30pm I left home for Picton, a tower was already going up NW of Sydney, it had a nice slope indicating that upper winds had hold of the top of it. 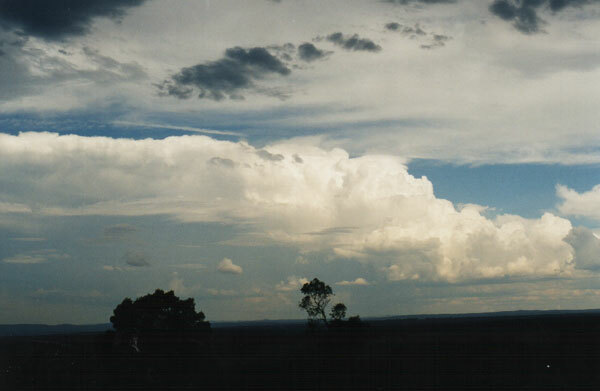 In contrast there was some very nice congestus over the Southern Highlands, but it was standing tall and straight as it had not reached the heights of the other cell yet. 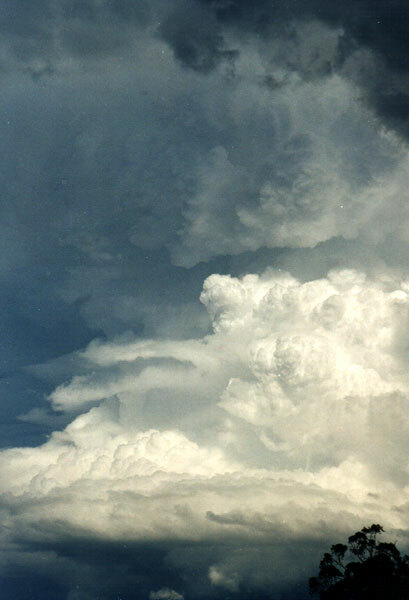 At Picton and a quick call to the Sydney crew to assess the situation, Michael Bath said he could see three towers down my way, all capped with pileus, I could not as I was under the anvil of one, and cirrus was blocking my view of others. I could however see the storm NW of Sydney and it was earlier boiling at the back end, but probably over wilderness. 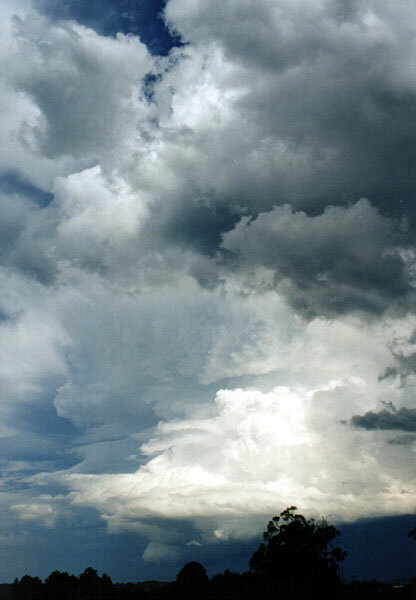 A smaller cumulus was now blocking my view of that storms rear. Compared to the the congestus further south these also appeared higher based. 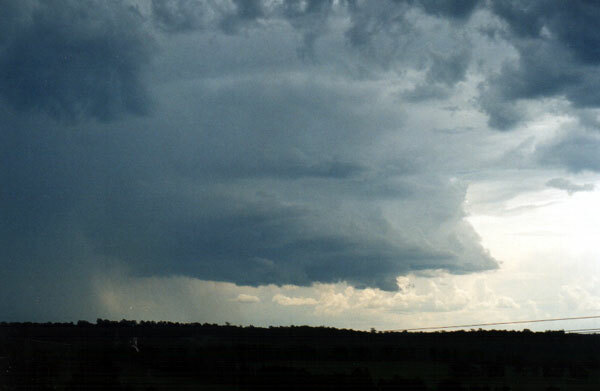 I waited a while at Razorback lookout, the earlier congestus southwards was now forming a decent cell, though strangely with little rain. The one west from Picton looked the goods, the north side had developed a dark rain free base and thunder was almost constant. At 1.30pm I headed for this cell by taking the road to Nattai and the Burragorang Valley, this road for the first 15km west from Picton is great for photos. At the town of ' The Oaks' I saw what seemed to be a brief funnel, could it be the same one as the Sydney crew saw. I should of pulled over and taken a photo, but storm fever had got the better of me and I had to get that little bit closer, I then ran into heavy rain.... which continued from The Oaks to Nattai , and it is pretty lousy chasing territory with tall forest. The road comes to a dead end at Nattai overlooking the Warragamba Dam lake, small hail started to fall. I turned around and headed back to Picton. Once back out in the open I saw that this storm had anvilled out, there was very little fresh growth, I was very surprised at just how quickly things had fallen apart. Meanwhile the storm to the south now looked like a monster. I hit the freeway reversing the mornings chase, I turned off at the Mittagong exit, then took the Bowral road. 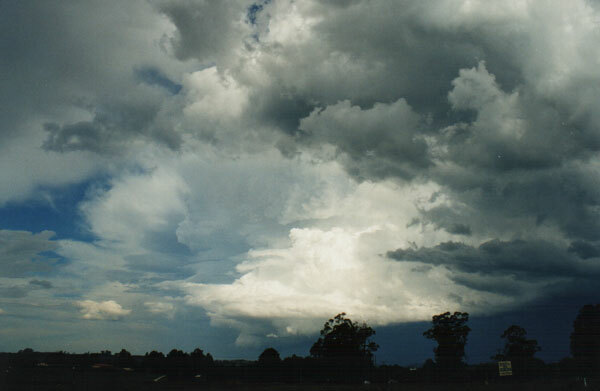 Just south of Bowral just after 3pm and I now had a view of a beautiful storm to the SE, the cumulus was quite wild looking, folding over on itself and containing odd accesory clouds, it was easy to imagine rotation, but I doubt it in hindsight. ( Anybody care to comment ) I continued on to Robertson, I pulled over here for 30 mins taking some video and photos as the storm moved out to sea, possibly just north of Nowra. A fresh line of storms was going up SW of Robertson, I waited until a dark rain curtain appeared then I was off. It was now 4pm. I headed S/SW via Wildes Meadow to Fitzroy Falls. From here I could see that the storm had snuck past me, and was now just SE. With CG's close by I was again infected by storm fever, funny how it manifests by forcing a dumb move or decision. This next dumb decision was to follow this storm down into Kangaroo Valley. Going down the pass and at least 2 CG's hit somewhere close by in the rainforest, flash - bang stuff, and hoping a rotting limb from a tree does not fall on the chase car. In Kangaroo Valley and it was core punching Thompson to the front, the rain was probably 100mm/hr, if not it was darn close, it was then heavy rain for the next 50 kms east to Shoalhaven heads and back to Kiama. Back home in the storm hole of Mt Warrigal - Shellharbour and it was bone dry ! There are no rain gauge reports that I aware of for Kangaroo Valley, but the town of Berry which probably received 25-50% less rainfall scored 51mm ( 2 ins ). Reports at work the next day from work mates that live in Kiama said small hail did fall. - make up your mind if you want to chase tablelands or coast. Trying both does not work because of the crappy mountain passes in the Illawarra. - the road west to The Oaks from Picton offers some good views, especially for those storms that love to hug the mountains. - forget from The Oaks to Nattai road. - do not let storm fever get the better of you. If you have a good photo opportunity take it, don't think " just another kilometre and I'll get a better one".